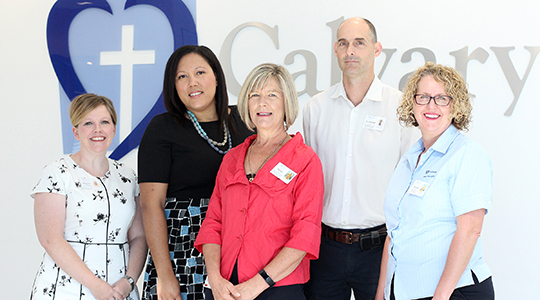 The blessing and opening yesterday of the $6.2 million for Calvary St Vincent’s Private Hospital’s Cardiac Catheter Laboratory and the Endoscopy Unit marks the delivery of much needed services for all Northern Tasmanians. The official opening was conducted by Calvary Chair, the Hon. John Watkins AM, and the new facilities were blessed by the Archbishop of Hobart, His Grace the Most Rev. Julian Porteous. Tasmanians in the North, North East and North West have the highest prevalence of cardiovascular disease in Australia according to ABS data. Yet the Australian Commission on Safety and Quality in Health Care analysis of 2014 confirmed that northern Tasmanians also experienced the lowest rate of coronary angiograms and cardiac intervention services nationally, with most performed within the public sector. The new Cardiac Catheter Laboratory and Endoscopy Unit are welcomed by many, including 45% of the Tasmanian population with private health insurance, relieving the high case load experienced by the public health system. In conjunction with staff having significant input into establishing the new purpose-built facilities; the cardiac development was led by Dr Geoffrey Evans, Calvary Director of Cardiology along with Associate Professor Brian Herman, Calvary Director of the Cardiac Catheter Laboratory and a team of highly experienced cardiologists. The endoscopy development was led by Gastroenterologists Dr Mark Veldhuis, Dr Scott Fanning and Dr Brent Mitchel, supported by colorectal surgeons and anaesthetists. Grant Musgrave, CEO, congratulated and thanked the architects, builders, doctors, specialists and staff for their valuable time and effort in ensuring the best possible environment was achieved. Both angiography and pace making services are provided by the cardiology team, and the new endoscopy unit provides a much improved patient experience in terms of privacy and space, being 20 percent larger than the previous unit.